PTSD (Post Traumatic Stress Disorder) is a condition that has had limited progress in the creation of viable treatment options for people afflicted with this despair and rage inducing disorder. Conventional medicine has come up with no long-term answers to the problem, which not only has a range of dangers for the person who has PTSD but also for the society at large. This study was the first of its kind to look at this epidemic in all branches of the US military, and its implications are terrifying. This is a mental health crisis that neither traditional psychology/psychiatry nor the VA and military leaders have provided any real solutions as the wars in Iraq and Afghanistan drag on. The situation is dire. I went to the first War in Iraq in 1990-91 as an Army Combat Medic. It was given the catchy nicknames of first Desert Shield and then, when the US started the air assault, Desert Storm. After coming back stateside, I started to suffer from bouts of rage, severe depression, thoughts of suicide (one botched attempt with pills and a bottle of whiskey), and more and more self-medication with alcohol. When I was discharged in 1998, I was in college full time and had a supportive family and group of friends, but still my alcohol abuse and difficulty containing my bouts of rage and the aftermath of chronic depression was accelerating. I battled through and achieved some academic and personal success, earning two undergraduate degrees and one graduate degree, getting married to my longtime girlfriend, and finding my first adjunct teaching positions. However, I was unable to contain the absolute anger I experienced at the most insignificant triggers. The crying of a baby, the smell of diesel fuel, the sound of a helicopter flying over, the dropping of a metal pan on the kitchen floor, a car following to close, or a dissatisfied boss (lost many a college teaching job due to my PTSD), and I would fly into uncontrollable screaming and yelling fits, at times turning this rage inward, falling to the ground in palsied sobbing and unintelligible babbling. By 2005, I quit drinking and felt this would solve the problem, save me from the growing fear I had of going outside, of my wife leaving me, of being out of control once again, and, most importantly, of taking my own life. It helped, but only temporarily. The rage, depression and suicidal ideation soon began again its assault on my daily life. Flash forward to today, the end of 2012, and I feel free of this dominating anger and the violent outbursts, my triggers of the past have little effect on my behavior and mood, and for the first time since before my wartime traumas I feel positive and excited about my future. This stunning transformation came out of my experience at the end of this Summer with a substance called Ibogaine. 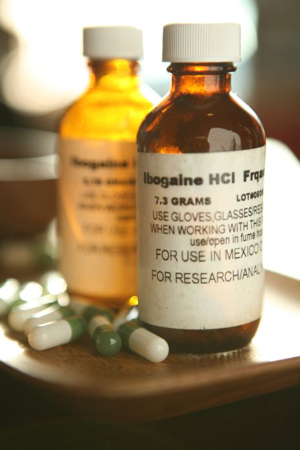 Ibogaine is an alkaloid derived from the Tabernanthe Iboga shrub found in West equatorial Africa and has a long history of shamanic and medical use with tribes of that region. In recent years it has produced media attention due to reports of effectiveness in treating drug addiction and providing opiate addicts with significantly reduced, or at times completely alleviated, withdrawal symptoms during detox. I had to travel to Costa Rica because of its illegality in the US ( Schedule I, along with Heroin and Methamphetamines), and was treated by Lex Kogan at the medically supervised Ibogaine treatment center named fittingly– Iboga Path . He required an EKG and Liver Panel blood test before I was allowed to come to his center, which he reviewed with his onsite doctor and medical staff to rule out counter indications for Ibogaine treatment. After my file was reviewed, I received the call that my treatment would be conducted on the 22nd of August and that I would be picked up at the airport by none other than Eric Taub, a central pioneer in the use of Ibogaine since the late 80’s. I have known Eric for 7 years, first meeting him in 2005 after I stopped drinking, then working with him over the years developing his novel but simple idea that no child should be without clean water, nutritious food, safe shelter and a digital age education. You can see our efforts to bring this concept to life by building models for International Cooperative Education and Global Sustainability Awareness and Action at our organization’s website,www.ICANRevolution.org. After a 35 minute drive through the hills of Costa Rica, I was dropped off at the center. My intake into the center was comfortable and laid back. Lex talked with me for a few hours, assuaged my fears about the experience significantly with his knowledge and hospitality, shown my room where I would be staying for the duration of my experience, and I ate my last meal made up of a myriad of local, organically grown fruit before my treatment in the morning. When I woke up that morning I was instructed to drink water, as much as I liked, because during the experience I would be limited to only a few sips an hour to avoid nausea. I filled up a few glasses, downed them, then made my way outside for a walk before my treatment to clear my head. The mountain air was crisp, as I walked up the hillside road lined with coffee plants and trees filled with tropical birds my mind was all abuzz with what was about to happen. So many thoughts permeated my brain, and as panic started to overtake me I found myself experiencing a low grade anxiety attack. It would be my last.